If you find an Australian 1966 20 cent piece in your change then you’d better take a second look. Did you know that a particular variety of the 1966 20 cent coin could be worth $100 or more! In 1966 the 20 cent piece was minted in 2 different locations. About half of those coins were minted in Canberra and half in London at the Royal Mint in Birmingham. Of the 30 million coins minted in London just one of the dies that were used to press those coins was different. There was a small difference that makes this coin unique and worth a great deal more. The oddity is that one die had a small differing feature. This variety is in the base of the 2 of the 20 on the reverse of the coin. There is an upward curve in that baseline of the 2 often called a wave, thus the nickname the ‘wavy 20’ or ‘wavy baseline 20 cent’. 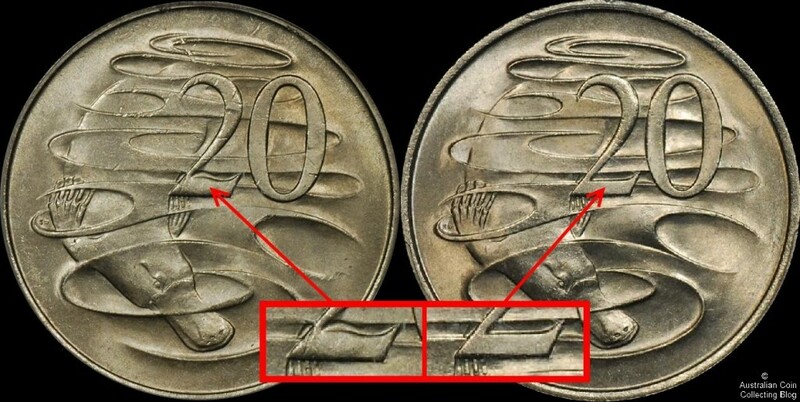 You can clearly see the differences in the “Wavy 20” and the regular 20 cent coin in the image below. The coin on the left has a distinct wave on the top of the baseline of the two. You’ll also note a corresponding indentation in the water swirl above the wave. By comparison the normal reverse 20 cent has no wave in either the base of the 2 or the water above the baseline. Beware there are many forgeries around mimicking this wave often derived from some sort of heat treatment of the metal. A genuine wavy 20 has a gentle curve that is paralleled in the water swirl directly above. A high grade example of one of these varieties is worth $3000-$5000 whilst a banged up coin you might find in your change might be worth $100-$200.